Cat owners know that cat trees are a must-have product for feline friends. There are hundreds of cat trees to choose from, and many of them look nearly identical. But each one has unique features and your cat has unique needs. Finding something that suits your preferences and budget is crucial. To simplify the buying process, the ReviewLab team thoroughly researched options in multiple categories. Some examples include basic cat trees and cat trees for large cats, among others. For every product we’ve chosen we provide you information about main features, key benefits, and everything you need to know to feel confident in your buying decision. Read more about our methodology. The SONGMICS Cat Tree Condo is a popular and highly-rated cat tree that offers endless options for leisure and fun. The spacious play place is covered in soft fabric on all levels. Including scratching ropes and hammocks, this cat tree offers a lot of stimulation. If you want a cat tree that’s durable and fun, the Armarkat Cat Tree Model B7801 is a solid option. 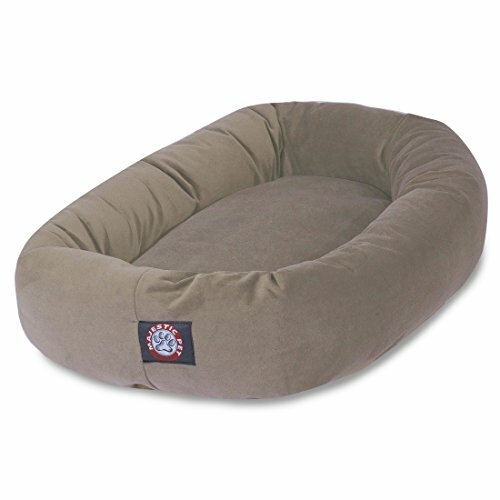 It’s built with pressed wood covered by soft faux fleece so it combines comfort and strength. Hanging toys and plenty of lounging space add to the reasons why it’s the best overall runner-up. If you're looking for a budget-friendly cat tree from a prestigious brand the Armarkat Cat Tree Model A5201 is a great option. It offers the essentials your cat will love and it's crafted from quality materials. It's easy to understand why this is our best value pick. Simplicity and style make the TRIXIE Pet Product Baza Cat Trees stand out from other frugal options. This tree is a space-saving option that features just the essentials and has a great price. If you own a small cat, you need a tree that they can climb with ease. 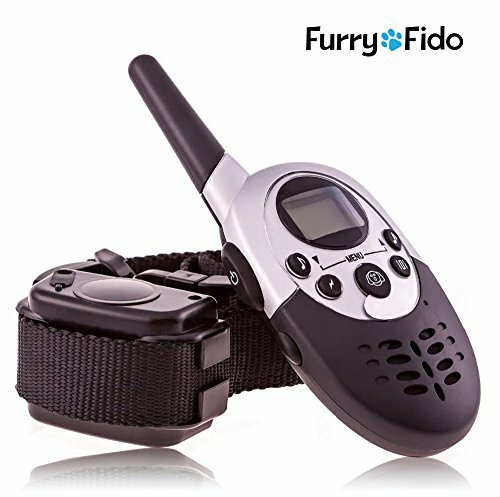 The Go Pet Club F3019 is perfect for kittens and small breeds thanks to its compact design. Even though it’s petite your cat will still enjoy the many features it offers. Check out our pick for the best tree for large cats if your cat needs ample amounts of space to jump, snooze and play. The MidWest Resort Cat Tree is a luxurious and solid cat tree designed for large breeds. Our pick for the best cat tree for multiple cats is a great find if you own two or more cats and want more play space for them. 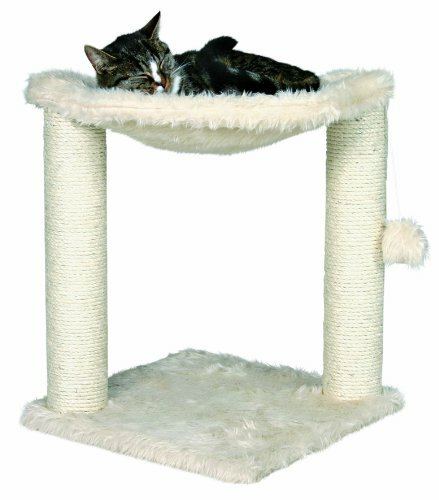 This roomy multi-level cat tree offers numerous toys, perches, sleeping areas and more. 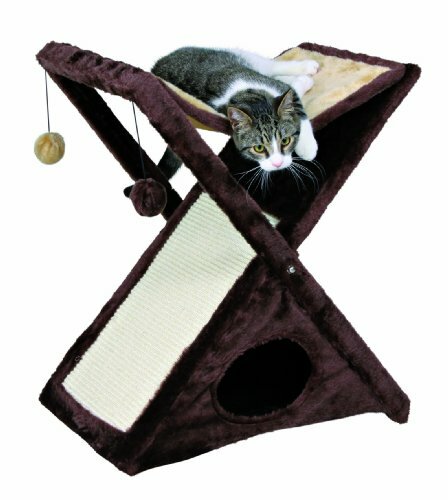 The TRIXIE Pet Products Miguel Cat Tower is basic and small-scale without leaving out any essentials. Your cat can get plenty of stimulation from this finely designed cat tree. 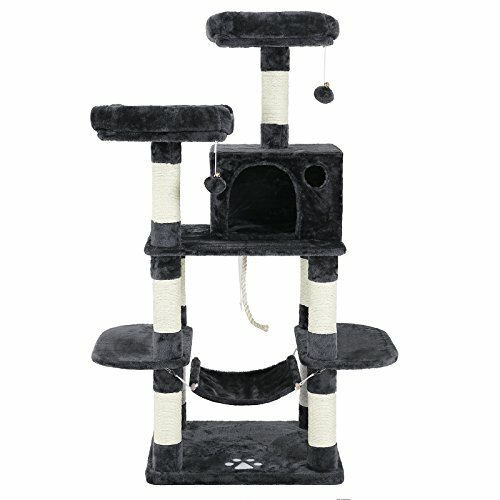 The full set of features and basic design make this a sure pick for the best simple cat tree. The materials that make up a cat tree are important for two main reasons. First, you want to feel certain the materials you buy are high-quality. For example, a wooden cat tree frame provides sturdiness. You’ll also want to consider what your cat already likes. Maybe he’s prone to lying on a plush blanket so finding a tree with plush fabric would be ideal. The amount of weight a cat tree holds is one of the most crucial things to consider. If you have a large cat or multiple cats you’ll need a tree designed to hold more weight. For smaller cats, lighter trees are usually fine. A cat tree’s height is something you should consider for yourself and your cat. You’ll want to pick a tree that fits comfortably into your living space. Look for the height and other dimensions listed in our reviews. You should also think about how high your cat typically climbs. Many cats love to leap high, but elderly or ill cats may need a shorter tree to suit their mobility. Safety and durability are two more aspects that are crucial when you’re making a choice. Look for trees with a sturdy wooden base or a similar design. Some cat trees also feature safety straps to secure them. It’s also good to consider how durable the tree is. High-quality fabric and a sturdy frame are likely to last longer than cheap, wobbly cat trees. When it comes to accessories think about features your cat would enjoy. There are many trees with dangling pom poms and other fun accessories if your cat loves toys. Consider a tree with multiple perches if your cat likes to climb. You know your cat better than anyone else so you can pick a cat tree that truly suits him. Cat trees in the $20 to $40 range usually have simple designs. These are a good fit if you want a no-frills option that's affordable. Larger cat trees with a wider range of surfaces and accessories range from about $50 to $100 and more. The majority of cat owners will find that the SONGMICS Cat Tree Condo offers great variety and quality materials for a good price. 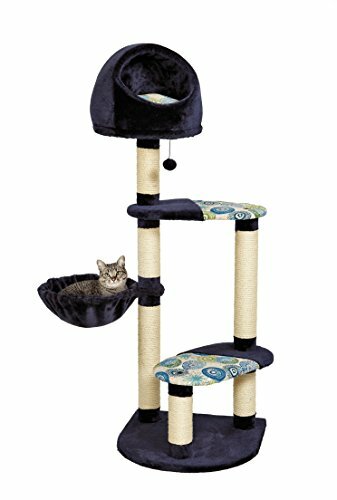 This cat tree stands tall at over 55 inches, and each level offers something unique. Your cats can enjoy two platforms, a hammock, a cat house, rope toys, scratching posts and much more. This pick is durable and designed from CABA-certified board, plush fabrics and battens for great security. These versatile features make this cat condo our best overall pick. High-quality fabric and CARB-certified board. The ultra smooth plush fabric adds a cozy touch to this cat tree. The boards used for construction are certified by the California Air Resources Board making this an eco-friendly pick. Multiple platform sizes suit many cat types. This cat tree offers spaces for snoozing, rocking and perching. The surface space of each platform varies so every cat can feel comfortable doing what they enjoy. Heavy base secured with battens. The very sturdy baseboard is secured with battens for added reliability. You can feel confident whether you’ve got one or more cats leaping and laying around. Dozens of comfort and play options. This condo features four perches, two basic platforms, scratch posts, one hammock, a cat house and hanging toys. The options for your cat are practically endless. Easy to assemble. Many buyers note that this cat tree is easy to assemble despite being 37 3/4"L x 24 3/4"W x 55 7/8"H. Some also mention that the instructions are very clear and direct. Cats love space variety. Buyers also mention that their cats love the ample variety of space. They can easily leap and explore without getting bored. Cats may scratch plush fabric. If your cat is used to scratching carpet he may be eager to paw at the plush fabric. Some users said this led to a bit of shedding and light tearing. The Armarkat Cat Tree Model B7801 is truly a one size fits all cat tree - it offers a bit of everything. Standing at over six feet tall this roomy model is great for climbing, sleeping, playing and scratching. There are more than 12 unique features for your cat to enjoy. Combined with a 70-pound weight threshold and a sturdy design our best overall runner-up is easily the Armarkat Cat Tree Model B7801. Holds up to 70 pounds. This 78-inch tall cat tree can hold a whopping 70 pounds. That makes it a great pick no matter what size or how many cats you have. Platforms are reconfigurable. According to user reviews, the platforms are reconfigurable for unique designs. You can arrange them to fit your preference when putting it together. Over 12 options for all cats. This cat tree features 6 platforms, one cat condo, 11 scratch posts, two hanging toys and more. Your cat is sure to love having fun or getting rest in this tree. Consistently deemed sturdy. Many users note that this tree is very sturdy. This is mentioned by owners of both single cats and multiple cats. Lower levels may be best for smaller breeds. The base features a small platform and the second level has a small climbing hole. These features are ideal for small cats and kittens. However, they won't prevent larger cats from easily climbing and enjoying the other levels. 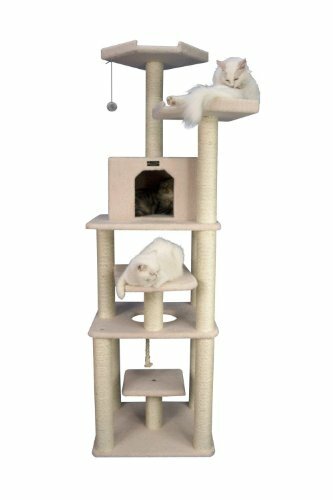 The Armarkat Cat Tree Model A5201 is a happy medium for buyers who want affordability without sacrificing any features. At just over 50 inches tall and with a weight limit of 20 pounds this cat tree is great for the average feline. 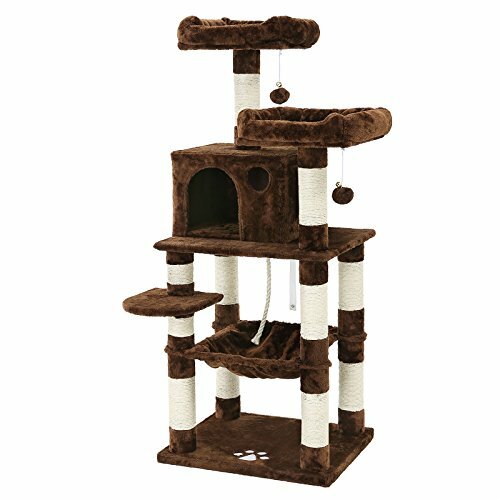 From the sleep-friendly condo to the enticing toy and scratch post, your cat can have it all with this cat tree. Can support multiple cats. The weight limit is 20 pounds so it safely holds two fully grown medium-sized cats (7.9 to 9.9 pounds). It’s also suitable for one larger cat, several small kittens. Designed for sleep and play. The middle of the cat tree features a private, dim and cozy cat condo. The top level offers a fun dangling mouse toy and there are scratch posts and platforms throughout. This design is ideal for sleep and play. Top platform dimensions offer ample space. The top platform measures 13" x 13" which is plenty of room for the average cat to lay comfortably. Easy and fast assembly. Buyers note that this cat tree is easy to quickly assemble. You can get it set up in no time for your feline to enjoy. Carpet covering is noted as average. Some reviews mention that the fabric covering the cat tree is fairly average. It may shed or pill within a few months if your cat scratches at it frequently. 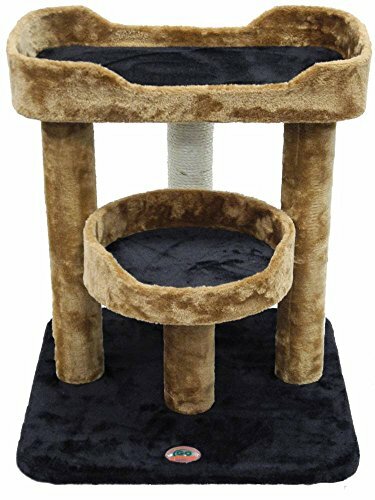 The TRIXIE Pet Product Baza Cat Trees offers the perfect balance of features if you’re looking for a basic budget-friendly cat tree. It’s equipped with a plush fabric hammock, two thick sisal-wrapped scratching poles and a simple toy. It easily fits small kittens and average sized adult cats. For an impressively affordable cat tree, you’ll want to consider this option. Soft but strong hammock. The relaxing hammock is covered in plush fabric, but it’s supported by a metal rim. You can feel reassured that it’ll support your content cat. Two thick sisal scratch poles. This cat tree has two 3.5 inch scratch poles wrapped in natural sisal. These give your cat ample room for scratching. One pole is also adorned with a fluffy toy pom pom for batting around. Simple design good for unique needs. User reviews note that this hammock is good for cats with particular needs. For example, it’s a great fit for older cats that can’t jump high. It’s also nice for a litter of kittens that need their own special space. Takes just minutes to assemble. Another factor that buyers mention is how easy this is to assemble. Some said it took only a few minutes and others mentioned 10 minutes at most. Hammock not ideal for large cats. Buyers with large cats say their pets seem a bit cramped in the hammock. However, this only seems to be an issue for larger cats, ranging from 12 to 20 pounds. Cat trees are made for all felines but you may want a petite design if you own a small cat or kitten. Small cat trees provide a cozy and fun space without being overwhelming. This tree type may look basic but it’s certainly not lacking. From multiple scratch posts to small-scale perches your cat will enjoy it all. The Go Pet Club F3019 Cat Scratcher Condo is the ideal height for small cats and kittens at 23 inches tall. It offers comfort and play features in an all-in-one style. The two small bed/perch combos allow your pet to climb or nap as they please. The plush fabric is ultra cozy and the natural sisal rope is perfect for scratching. This finely designed option is easily our top pick for the best tree for small cats. Small yet spacious design. The measurements of this cat tree and sleeper are 19.25"W x 19.25"L x 23"H. This makes it a good fit for small felines but it also gives them room to stretch, climb and play. Two bed/perch combos. The cat tree features two perches that double as beds. They are close together so climbing or jumping from one to the other is easy and safe. Great height for window watching. Several buyers noted that this cat tree is great for cats who like to window watch. Many mention setting it up next to windows so their cats can comfortably enjoy looking outdoors. Beds/perches may not be thoroughly padded. Some buyers stated that the fabric covered beds don't feel well-padded. However, this wasn't a common complaint as many buyers stated that their pets loved the beds. 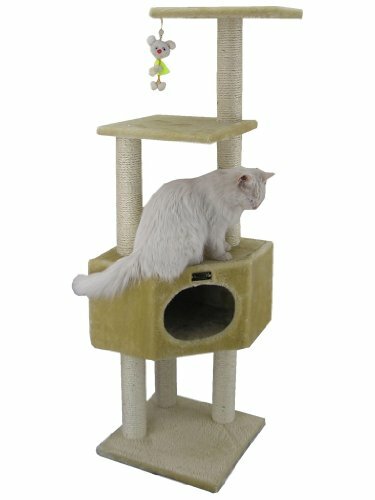 Large cats have unique needs so cat trees specifically suited for bigger breeds are ideal. These cats need secure play areas that offer ample space for climbing and lounging. The surface space of the beds, hammocks and other platforms should be notably roomy. All of these features combined with sturdy yet soft materials are your best bet. The Midwest Resort Cat Tree is perfect if your furry feline is larger than average. This 4-tier tree stands tall at 60 inches and features a multi-level design. From the high-rise hooded bed to the roomy platforms, this is a great fit for bigger cats. With a one-year manufacturer’s warranty and great buyer feedback about sturdiness you can give this tree a shot without hesitation. High-rise bed for leaping. The high-rise hooded bed is designed to cater to a cat’s jumping instincts. This gives larger felines exercise as they jump from perch to perch to reach the bed. Spacious perches and hammock. The hoop hammock and perches are lengthy enough to suit heftier cats. Buyers mention that it works great for their cats, some of whom weigh 15 pounds or more. One year warranty included. This cat tree comes with a one-year manufacturer’s warranty. This can give you added confidence about the durability of the product. Supports heavier cats. One common theme in buyer feedback is that the cat tree is sturdy enough to support heavier breeds. Takes up a lot of real estate. Reviewers do note that this cat tree takes up a lot of floor space. And some say they wish the base was a bit heavier, given the height of the tree. In order for multiple cats to live in harmony, they’ll need a cat tree that has plenty of bells and whistles. Some examples include multiple perches, scratch posts, dangling toys and so on. A multi-level design should be your top priority. This style gives your cats their independence while enjoying their cat tree. The SONGMICS UPCT15Z is a super spacious cat tree that offers tons of options for relaxing and fun. From spacious beds to hanging pom poms your cats get all of their needs met with one tree. This luxury-sized cat tree condo also features sisal rope scratching posts, a safety strap for durability and plenty of surface area for climbing and sleeping. Six options for climbing/sleeping. This cat tree is equipped with two cat beds, one house, two perches and one hammock. This means your cats can easily make themselves comfy without feeling crowded. Heavy-duty base and safety strap. The CARB-certified wooden base is combined with a secure safety strap to keep this tree in place. Multiple cats can jump and enjoy the tree without it toppling or wobbling. Ample surface area and height. The tree stands tall at over 55 inches, and each surface offers plenty of room. This includes the two 14" x 14" beds, a 24" x 20" base, a 14 ¾" by 19 ¾" hammock, and more. This makes it a breeze for several cats to climb, pounce, and play. Owner-friendly assembly. Many buyers noted that this tree is impressively easy to assemble. Despite the size and layout, they noted it’s simple to build and doesn’t take much time. May not come with Allen wrench. A very small number of buyers mentioned that the Allen wrench was missing from the set. However, the seller did reply to these concerns to resolve them quickly. If you’re limited on space or need to suit a cat with limited mobility a simple cat tree is a good pick. These basic cat trees are typically smaller and easier to store, while still offering cats plenty of stimulation. A simple cat tree doesn’t have to lack a single thing and TRIXIE Pet Products Miguel Cat Tower proves it. This 11-pound cat tree comes with a sleek hammock, cozy condo, sisal rope scratchboards and engaging toys. At 20.25" x 13.75" x 25.5", you can easily put this foldable option wherever it’s most convenient. If you like clean straightforward designs that aren’t lacking you’ll want to consider this cat tree. Foldable for easy storage. This uniquely designed cat tree is easily foldable for effortless storage. The 11-pound tree is fairly lightweight as well. Great for small spaces. This cat tree is ideal for small spaces as it measurements are only 20.25" x 13.75" x 25.5". It can easily fit in bedrooms, shared living areas and more. Has features of larger cat trees. Despite having a very compact design, this cat tree offers the same benefits of larger and more expensive models. It features a hammock, condo, scratching boards and hanging toys. It’s also plush covered for ultimate comfort. Supports kittens and adults alike. Buyers mention that they’re happy with this purchase for kittens, small cats and average adult breeds. This can reassure you that it will be a good fit for your cat. Plush fabric may shed. Some cat owners mention that the tree's brown fabric sheds easily. This may require a bit of vacuuming around the tree from time to time.